They always say that history has a way of repeating itself. But often, not in the ways we expect. I feel like it’s better to say that history mirrors itself — we will find people whose stories resonate with ours that it’s almost as if we were separated across time and space. 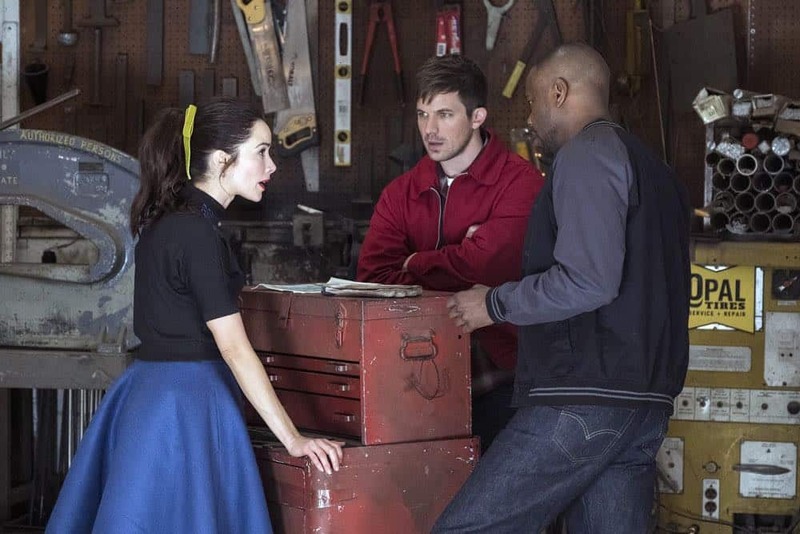 In this week’s episode of Timeless, Wyatt Logan meets Wendell Scott and the two connect over their love of cars, but also over their similar experiences with their fathers. Really, this episode focuses on the importance of people in history, and the fight against time. We get to know a Rittenhouse agent more and sense his struggle, and we get to see Wendell’s view of his present circumstances and his hope for the future. Elsewhere in the episode, Carol has difficulty wrangling Nicholas and we might have seen a slight shift in her perspective about this whole Rittenhouse ordeal. Just a little. We’re traveling back to 1955 this week, but our Time Team really has no idea what Rittenhouse is up to. The Mothership landed there, but nothing significant happened in the town of Darlington, South Carolina. But Wyatt has a thought — what if Rittenhouse isn’t interfering in current important historical events? What if they’re anticipating the moments before events happen? Since he’s the only NASCAR nerd on the team, Wyatt informs the rest of the gang that there’s a significant NASCAR driver who gets his start at the Darlington 500. So the team travels back to 1955 with a few jackets from Old Navy because budget cuts, man. You’ll imagine the team’s surprise and ours as the viewers when we realize that the driver who the Time Team thought they were rescuing from being murdered by Rittenhouse is actually a Rittenhouse agent himself. See, Rittenhouse’s plot was a bit more convoluted than Wyatt gave them credit for — the evil organization planted Ryan back in time and have been leveraging his influence in order to get to the Darlington 500 and then take control of the car companies in attendance. It all sounds very Rittenhouse-y, but here’s where I actually really enjoyed the plot — Ryan Millerson actually liked his life in the 1950s. He got married. He has a child on the way. He might have been an agent from 2018, but he fell in love with his life in the 1950s. The plot twist this season of Rittenhouse agents being scattered across space and time (okay, mostly just time because I watch too much Doctor Who) lends itself to some really good stories like this week’s. It begs the question of what happens when you live in an entirely different era. Will some of these agents forgo their mission (like Ryan was tempted to and — I believe — probably would have) in order to hold onto the reality of the life they’ve built? Will some agents lose themselves in the past, desperate to return to 2018? Will the mission mean anything to them anymore? While Emma is your pretty cut-and-dry villain (complete with a strut, threats of death, and sarcasm), I like that — for however briefly — we got the chance to examine the fact that not everyone in Rittenhouse is like Emma; these are people who have made choices (bad choices) but when push comes to shove, might not always align with the Rittenhouse code of conduct. Regardless, Ryan ends up dead — along with another Rittenhouse agent, thanks to Wyatt — and Emma is a bit concerned about the fact that Carol seems to be making no progress with Nicholas. If you’ll recall, the team picked him up and dropped him into 2018, but all Nicholas wants is pickled eggs and to paint. Carol is a little frustrated that Nicholas isn’t this great, genius mind that she was hoping for (and promised everyone else) who would lead Rittenhouse into the future (or… past? This is weird with time-travel shows). Carol gets her wish when Nicholas essentially paints a manifesto on the wall. We’ll get to that later on, but suffice it to say that Emma is thrilled. Carol doesn’t seem to be as much. Wyatt is the kind of character who heavily guards his past. It’s been used to hurt him and it, itself, has hurt him. This week, we got to learn a little bit more about Wyatt’s abusive, drunk father as he and Wendell share stories. Wyatt, while helping Wendell fix his car, talks about how he used to fix up cars with his father. But it wasn’t a father/son bonding experience. Whenever Wyatt mouthed off, his dad would throw him in the back of the car and drive it around until something broke. It was Wyatt’s job, then, to fix whatever was wrong with the car. And he wasn’t allowed to come home until he did. But when he turned 15, Wyatt left — he stole his father’s car, drove it until the pistons blew, and then drove it straight into a lake. So you’re probably wondering how Wyatt became the soldier and protector we all know and love him to be. It’s interesting because loyalty is one of Wyatt’s defining characteristics. He’s stubborn in his loyalty to the people he cares about, but he’s often intensely guarded emotionally all the same. Learning more about his past, it makes sense: Wyatt will never be his father. He’ll never harm the people he’s supposed to love, and he’ll never abandon them. But because Wyatt experienced abuse and trauma, he’s hesitant to share the depth of his life with someone. When he and Lucy have an intimate conversation later about what he confessed, she’s half-amused, half-concerned that Wyatt can just turn his emotions on and off like a tap. One minute he’s sharing stories about his dad, and the next, he’s silent. I think Wyatt’s complexities stem from this dichotomy, really — this desire to be vulnerable, but the fear of intimacy with people who could hurt him, emotionally. There’s something so lovely about the fact that Wyatt and Lucy balance one another out in that way, and are able to share so much about their lives without fear of judgment or condemnation. There’s hesitancy, of course, because vulnerability is scary. But both Wyatt and Lucy find comfort and safety in each other, which is so crucial because that stability is what they both crave. Additionally (in a more comedic scene), we learn that Wyatt was a bootlegger (of sorts... more so the implication is that he was a drug runner) when he was a teenager. When Rufus and Lucy look at him, stunned, as he explains what he did, we — the audience — realize we don’t know much about Wyatt Logan. As he points out, I guess we never asked. I mean, did Wyatt and Lucy REALLY need to be thrown into the secret hatch of the trunk together? Probably not. But they were! And because they were, I’m going to talk about the growing intimacy between these two characters. I’ve shipped them from the beginning of the show and I’m still shipping them now. There’s a beauty in their relationship — Lucy is so trusting, while Wyatt is a bit more guarded; Lucy is the emotional bedrock of the group while Wyatt provides the strategy and logic. And in this episode, the two commiserate over their terrible parents together. While in the back of the car, the pair gets super duper cozy (cuddly and all), but also emotionally cozy — there’s an irony in the sense that Lucy believes Wyatt didn’t care about his dad or admire him because he was an abusive alcoholic. Wyatt gently corrects her because of course he still looked up to his dad; it was his DAD, after all. Lucy is still struggling because the woman she admired most in the world and loved immensely turned out to be a monster — or, at the very least, in the den of monsters. I love that these two are being more and more intricately bonded this season. Last year, they went through hell and back together. This year, they’re not only facing the emotional and literal consequences of Rittenhouse, but also tethering themselves to each other in the process. Every obstacle brings them closer, and every battle they fight proves they’re on each others’ sides. Plus, they’re real cute together. “The Darlington 500” ends with something pretty interesting. Carol and Emma meet with Nicholas, who unveils a painting to the rest of Rittenhouse. “We few will save the world,” he says as he declares how Rittenhouse can start the world over — the right way. If you listen closely (or even if you don’t listen closely) you’ll notice how rather genocide-y that sounds. Nicholas tells Rittenhouse that their job is to take the best of history, and slough off the worst of it. Time is theirs to do with as they please, so why not sculpt away at the human race until it “reaches perfection everlasting”? Emma thinks this is the greatest idea since sliced bread, but when we pan to Carol’s face, her hesitancy and reminder of Lucy’s “be on the right side of history” warning seems to be etched across her face. As irony would have it though, “we few will save the world” is actually the slogan for the good guys, too. The Time Team will always continue to fight for justice and do what’s right — regardless of who they’re fighting against. The question is: will Carol choose to fight with Rittenhouse or will what semblance of a conscience she has left choose her to do otherwise? Ah, so Wyatt and Lucy aren’t rooming together in the bunker. That makes sense from a logical perspective, but my shipper goggles had hopes. Some minor stories I did not talk about earlier: Jiya is still having what appear to be flashes of other timelines. Except... maybe they actually are premonitions of the future. At the beginning of the episode, Jiya freaks out because she imagines seeing a burn on Rufus’ arm. It is not real, of course... until the end of the episode in which Rufus returns from the 1950s with a burn on his arm. Meanwhile, Agent Christopher essentially has to force Connor from speaking at a symposium. My favorite thing in the episode is when Wyatt rattles off names of NASCAR drivers and everyone looks at him with a mix of confusion and hilarious disinterest. I had wondered why Michael Rady looked so familiar and then I realized he was in The Sisterhood of the Traveling Pants. Can we all appreciate the running joke of Rufus giving Wendell “the nod”? Lucy confiscating moonshine from Wyatt is hilarious. Did you notice Wyatt gave Lucy his jacket? Too cute. What did you think of this week’s Timeless? How badly do you want Wyatt and Lucy to kiss? What’s really going on with Jiya? Sound off in the comments below!